Even if you buy organic, which is more expensive, the chance that your food was grown in rich, composted soils is fairly slight. Examine industrial-scale organic farms and you likely won't be pleased with the soil-nutrient tests, or much else, for that matter. Luckily, growing lettuce is simple, cheap, and can be done almost anywhere. The results are almost always worth the effort, and you'll be doing yourself a nutritional favor. I've had success growing lettuce in some fairly poor soil, but anyone on a healthy raw food diet can easily improve growing conditions with the byproducts of their diet. To make good compost soil, you want equal parts of predominately brownish organic matter like leaves, dirt, bark, and shredded newspapers that are high in carbon, and the predominately colorful fruit and vegetable remains like rinds, skins, cores, and other produce scraps, which are high in nitrogen. Simply throw these into a composter (or into a pile) mix it up, let it sit for a year and you should have some good soil for growing lettuce. You can use this rich mixture not only to improve the soil in your garden, but also to fill indoor and outdoor containers. The large amount of organic waste raw foodists produce makes this quite easy, but if you want to go farther you can consider amending your compost with rock dust or other organic sources such as manure. Your average stretch of ground is as good a place as any for growing lettuce, provided it gets at least three hours of sun. Depending on how involved you want to get, you can simply turn the soil with a shovel (unless you're a no dig proponent) and add your compost to it, or test the soil to see how rich it is and make the necessary amendments. Then either plant your seeds as the package suggests or transplant in the seedlings you have grown or purchased. Wait a few weeks and you've got lettuce. Keep improving the soil every year and your harvest will keep getting richer. 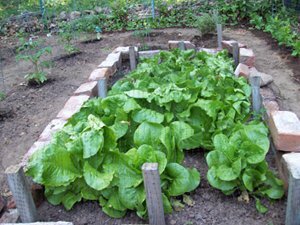 Raised bed gardens, which can take many shapes, such as my own keyhole garden, can make growing lettuce easier. They cut down on weeds, you have richer soil becuase it's all the stuff you've added, and the shape is convenient to access. 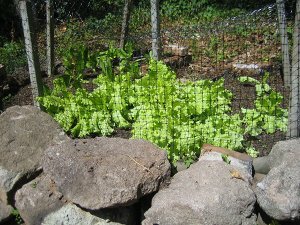 If you need to screen your lettuce because animals are an issue, putting a net over a raised bed tends to be easier than attempting to drive stakes into the ground. Raised bed need not be complicated. You can simply stack up wood, bricks, hollow cinder blocks, rocks, or whatever else you have on hand and fill it in with dirt. Even if you have no land to plant, you can use containers and trellises for growing lettuce and other food. You'll be amazed at how much food you can grow in small spaces. For inspiration, check out the beginning of this great permaculture video for balcony gardening ideas. When I was in college I lived in second-story dorm room, and I was unable to garden. I'm a wily guy, though, and I began growing lettuce and other plants inside, and my results were surprisingly good. 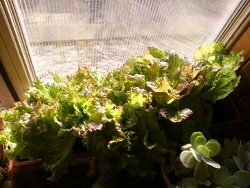 An outdoor window box is fine for growing lettuce, and inside that window the situation isn't much worse. While not all the sun's rays can reach the plant through the glass, inside the temperature will be warm enough for growing lettuce all winter, provided that the window get three or more hours of full sun a day. 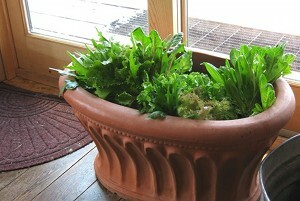 Indoor window boxes and pots can all be used to great effect for growing lettuce. Fill them with good composted soil and you can have a supply of lettuce all year long. Lettuce thrives best in the spring and fall, but you can grow it during the summer too. Very high temperatures will lead to wilting leaves, so during these times it's best to grow lettuce in partial shade, or erect some sort of screen over your bed. The most heat-resistant varieties are romaine and summer crisp. Lettuce likes water, so don't let more than a day go by without rain or watering. If you can manage it, the best time to pick lettuce is in the mornings before the sun is directly overhead, as the leaves swell with water overnight but lose some of it in the heat of the beating sun. Watch a video with tips for growing lettuce in your yard. Learn about the many varieties of lettuce available. Find more organic gardening articles here.